Saturn is a smart, energetic lovebug who likes to play play play! This goofy guy came into the shelter as a stray, and now he's eager to make being a beloved family dog his full time job! Saturn is basically like a big puppy, except he won't pee on the carpet or chew on your shoes. He's a great alarm clock - he wakes up every morning so happy and ready to take on the day. And he's extra cuddly in the mornings, which makes waking up that much nicer. He'll also keep you company in the bathroom and check on you in the shower to make sure you're ok.
Saturn absolutely adores his people, is very affectionate with them and LOVES to cuddle. He prefers to get his ya-yas out through high energy play, so he can spend the evening curled up with you for snuggles. If you sit down, he'll crawl right into your lap and smoosh his face into your chest. 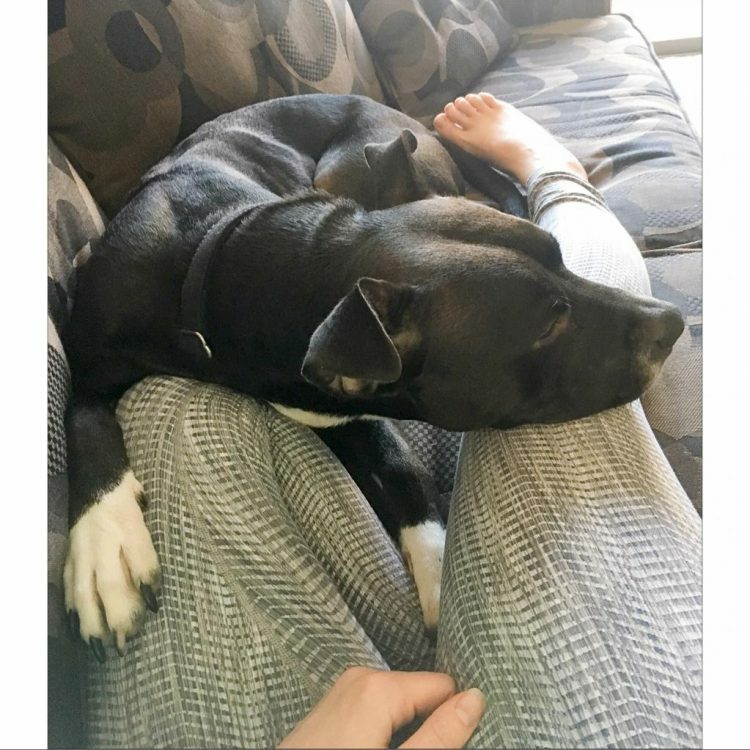 He just wants to be as close to you as possible, and you'll know how relaxed he is when the snoring starts (it's loud but adorable)! 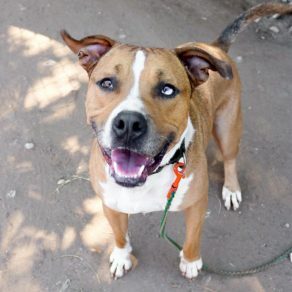 Saturn has a rough and rowdy play style and generally gets along with other dogs as long as they like to play and wrestle, and he may be able to go home with a well-matched doggie sibling. He's also a total water bug and loves to play in the kiddie pool and chase water from the hose. He makes for a great trail buddy and he absolutely loves playing tug of war, but he's also happy to entertain himself with toys or sunbathe while his people are doing people things. Saturn's a smart pup too and has an adorable eagerness to please his people. He knows sit, down, and shake, he's fully house-trained, can be left home alone without getting into any trouble, is easy to bathe and great in the car. He also loves to run around and show off all the skills he's learning in APA! 's Total Obedience Program! The Total Obedience Program (TOP) is modeled after the AKC's Canine Good Citizen (CGC) test. As a TOP dog, Saturn has a personalized training plan and works with a volunteer trainer several times a week to help him learn the skills to become the best dog he can be! Saturn is learning skills like sit and down, walking nicely on leash, sitting calmly when approached by strangers or other dogs, staying in a sit or down until told "free," coming when called and "Place", which means he will go to a specific place in your home on command. 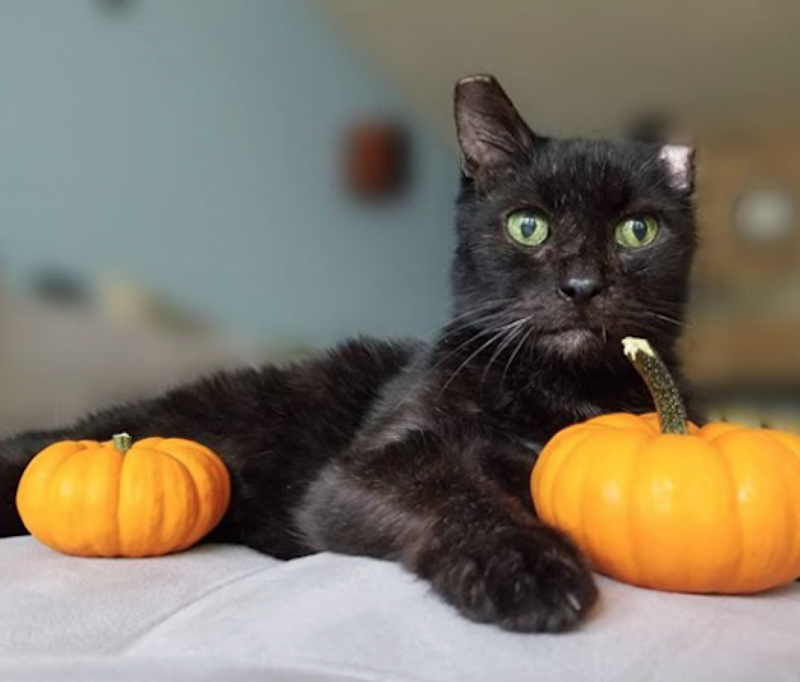 Saturn connects so deeply with his people and can't wait to find his forever lap to rest his head in. Come meet him! I saw Saturn (https://www.austinpetsalive.org/adopt/dogs/apa-a-60239) on the Austin Pets Alive! website and would like to request more information.